Sugar snaps are the jackpot of the pea family. They’re as sweet as fresh spring peas, but their entire pod is edible. If you’ve ever spent some time shelling peas, you know this is a godsend. Sugar snaps’ pods also pack them with an extra boost of nutrition, for instance 150% more vitamin C than regular garden peas. They’re comparable to snow peas, only far more sugary and delicious. I.e., the golden jackpot of the pea family, especially when it comes to stir-fry. Here, I’ve spruced them up with some of the classic flavors of Asian cuisine – soy sauce, hoison sauce, and sesame oil. 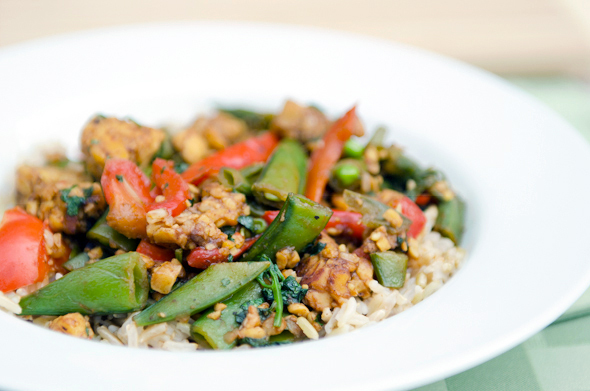 Tempeh takes to these flavors well, too, generating an almost “meaty” consistency for this vegetarian dish. For the spring season, sugar snaps generally peak around June, so be on the lookout at your local farmer’s markets in the upcoming weeks. I know I’ll be looking to purchase more of these perfect pods. Combine rice with 2 cups of water in a pot. Cover, and bring to a boil. Reduce heat to a simmer, and cook 45-50 minutes, or until rice is tender and fluffy. Meanwhile, heat oil in large saute pan over medium-high. Add tempeh and peppers, and saute 3 minutes, stirring occasionally. Toss garlic into pan, and cook additional two minutes. Stir in sugar snaps, soy sauce, and hoison sauce. Let cook until sugar snaps are tender, 4-5 minutes, stirring occasionally. Add sesame oil and cilantro, and cook an additional minute. Remove from heat, and serve atop rice. Yum! I love tempeh, it has such a great nutty flavour and is so much more nutritious than tofu! 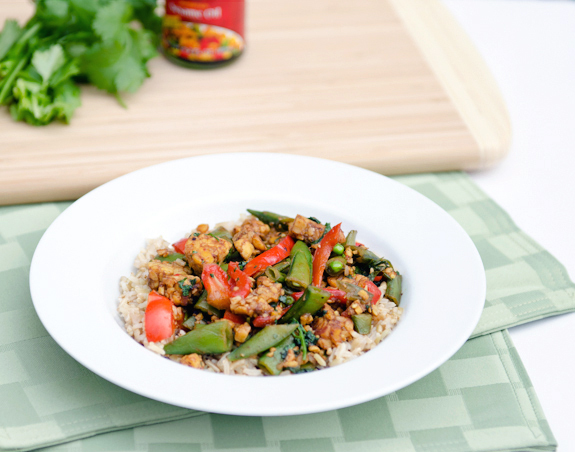 Snap peas are a great idea in a stirfry. Thanks for the recipe! I’m loving all the recipes with hoison sauce I’m finding today! I love that stuff. And, I love tempeh 🙂 Thanks Grace! I like tempeh, and your pictures are so delicious!